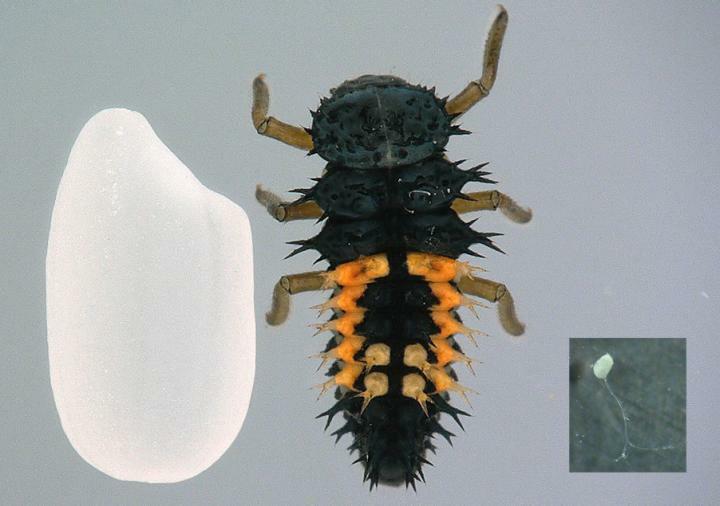 A new study has found an effective way to cryopreserve – preservation by cooling to very low temperature – and subsequently transplant ovaries of the multicolored Asian ladybird beetle, Harmonia axyridis. In mammals (including humans), long-term cryopreservation of fertilized eggs, sperm, ovaries is possible. However, in insects, cryopreservation of fertilized eggs has not been successful, and cryopreservation of sperm and ovaries has been put to practical use only in silkworms. The study, published in the Journal of Insect Biotechnology and Sericology in July 2018, is the first to report a successful ovary cryopreservation method in a small non-model insect, or an insect that has not previously been widely studied in this manner. It shows that female ladybird beetles that received transplants of previously frozen ovaries gave viable offspring. The investigators highlight that transplantation of cryopreserved ovaries is a viable alternative to all the complications that are associated with maintenance of insect colonies in the laboratory. The team, led by professor Teruyuki Niimi at the National Institute for Basic Biology (NIBB) in Japan, found that the average rate of viable females that were transplanted with originally cryopreserved ovaries was 26%, with a peak rate of 40%, which the researchers deem sufficient for the technique to be of practical use for maintenance of genetically diverse H. axyridis lines. Niimi, the corresponding author of the study, points out that the Asian ladybird beetle is known for having more than 200 color patterns in its forewing. This striking feature makes the tiny insect an important model for scientists studying how genetic and genomic changes can lead to the different physical traits in plants or animals. Niimi adds that his laboratory currently maintains more than 1,000 ladybirds, but that it "is very laborious task. In addition, long-term rearing of animals increases risk factors such as disease contamination and human errors that can wipe out valuable genetic lines, genetic mutations interfere with specific desirable genotypes and inbreeding depression." He underlines that cryopreservation is the best alternative to avoid the aforementioned, which is why they have focused on developing an effective procedure of H. axyridis ovary preservation. The methods that were used were adapted from previously reported methods of ovary cryopreservation in the silkworm, Bombyx mori. The team successfully preserved ladybird beetle ovaries by first slowly cooling them down to -80oC in a freezing container at a rate of 1oC per minute. The frozen ovaries were then placed into liquid nitrogen, where they were stored until further use. Immediate thawing at 37oC was done at the time of transplant, and thawed donor ovaries were then placed in the recipient larva's body. Despite facing several difficulties, including the small body size of H. axyridis, the insects being difficult to visualize, rapid clotting as well as the organs being generally small to handle, the researchers set up fine manipulation tools as well as dissection techniques whereby they successfully obtained fertile females that received originally cryopreserved ovaries. While the researchers indicate that the rate of fertile females from frozen ovaries is sufficient for the maintenance of a H. axyridis genetic line, they are confident that this number will be improved by further enhancing surgical technique as well as transplanting ovaries into younger insects. The researchers also believe that the tools and techniques that they have developed in this study will benefit research in other insect species including various small insects. Haruka Kawaguchi, one of the authors of the paper, further adds that, "We believe that this achievement will be useful not only for experimental insects, but also for endangered insect species that are difficult to maintain in a laboratory." They state that their next steps are geared toward developing methods that will enable the preservation of genetic resources derived from males and as such will focus on the development of cryopreservation of testis and sperm. This study was supported by the Japan Society for the Promotion of Science Grants-in-Aid for Scientific Research (KAKENHI) Grant Number 16H02596 and a Collaborative Research Project organized by the Interuniversity Bio-Backup Project (IBBP) of National Institute for Basic Biology.